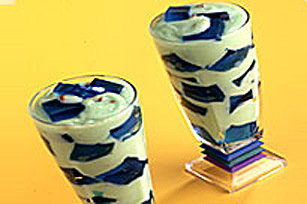 A blue and green dessert? Yes, it's true. You have to make it to believe it. DISSOLVE jelly powder in boiling water. Add cold water and stir. Pour into an 8 inch square baking pan. Refrigerate until firm, about 3 hours. PREPARE instant pudding as directed on package. CUT jelly into small cubes. Divide the cubes into 4 parfait glasses. Top each with 1/2 cup prepared instant pudding.